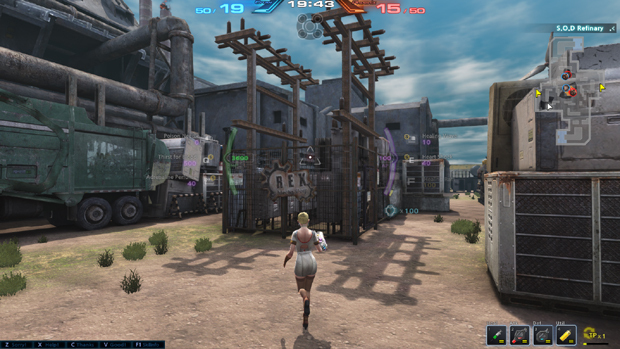 Cronix is a a Korean MOSA (Multiplayer Online Strategic Action) being brought to the West by Gamengame. 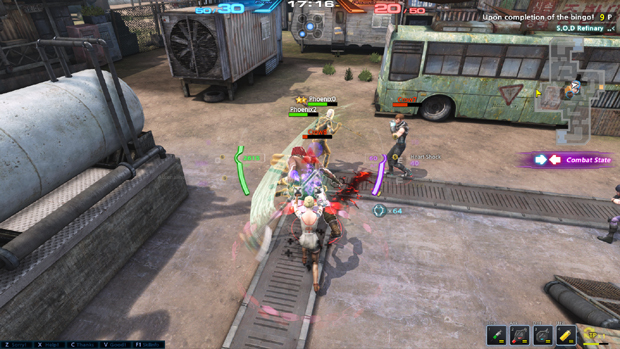 It features, as the name suggests, action combat with a strategic undertone. This puts it in the same genre of games like Smite. The theme is a post-apocalyptic version of our own world, which means guns and melee, but not magic. Strategy, action, guns, and hot women… Cronix seems to have all it needs to give you a good time, so lets see how it holds up to review. Customization is decent for this type of game. You can change outfits, get new equipment or equipment effects, add accessories, and all those sort of things. Personally, I’m on the fence about the customization. I think it’s alright, but I also think more could be added (and I’m sure more will be added). I’m also of the opinion that it doesn’t add much to the game. Depending on the type of player you are and the sorts of games you’ve played in the past, you may or may not be impressed with what Cronix has to offer. Right from the start I enjoyed the graphics in Cronix. The visuals are crisp and detailed, so I have no complaints when it comes to quality. The post-apocalyptic visuals and setting reminds me a lot of one of my favorite animes, Trigun. 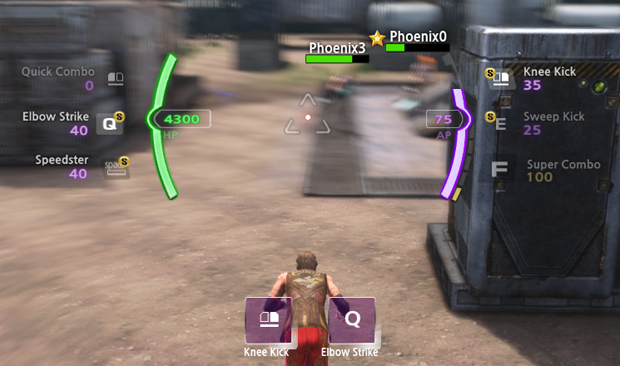 The UI is perfect for this type of game – it manages to give you all the information you need without cluttering the screen and ruining the experience. Simply put, I am completely satisfied with what Cronix offers in the graphics department. The controls are another thing I found spot-on, at least for the most part. I did have some minor disappoint; there is no jumping. Well, that and there is (so far as I can tell) currently no way to customize key bindings. The control scheme doesn’t feel natural to me, so I would like the option to change some things around. But neither of those hinders my ability to play the game, so I can’t complain too much. Rather than the usual 1-4 or Q-R that most MOBAS use, Cronix uses a different scheme. Left click, right click, Q, E, Spacebar, and F are what you’ll be using to activate abilities. You’ll also use 1-4 to activate various potions and buffs called Tonics. And, like I said, it currently doesn’t offer any ability to change this. So, if you’re the type of person who can’t make use of this control scheme for any reason, you’re SOL, unfortunately. The community… is not quite there yet. There will be a Steam release soon, as the game was recently Greenlit. But for now it’s difficult for me to find a game. I can definitely say the population will end up booming, though, as the game is fun and easy it pickup. The question is if Cronix can maintain that booming population for the long term. 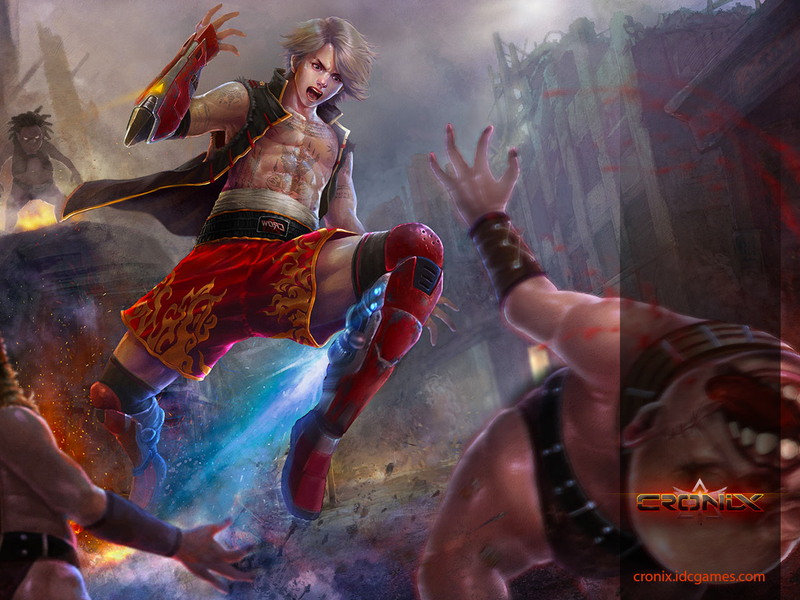 Gameplay is very MOBA like, but with action combat. Personally, I don’t see anything in the game that differentiates it from a MOBA that would give a good reason for the MOSA title. If anything, it’s more “battle” focused than something like League of Legends or DOTA 2. MOBA, in this context, could stand for “Multiplayer Online Battle Action,” but “arena” still applies. So, while I certainly found the game fun (which I’ll get to in a moment), I would say it doesn’t have as much strategy as the MOSA title it uses would imply. Game modes are objective-based, though, so there is some strategy involved in achieving those objectives. 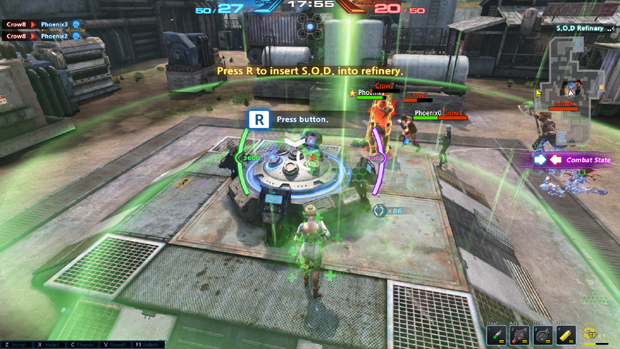 The primary game mode is a 5v5 match with a central map objective that the teams fight over. There are still three lanes, but they don’t play the same roles as they do in other games. You try to “refine” a resource called S.O.D. by taking it from a terminal in a side lane to the central objective of the map. However, you can also just focus on killing the enemy team to win. There’s also a 3v3 Deathmatch mode and a 7v7 capture-the-point mode. Combat is fast-paced, so you can potentially find yourself dead in moments depending on who you’re playing. Your go to skills are built around an Action Point (AP) system. Each ability you execute will consume AP. However, out of combat, this AP regenerates very fast. Of course, each character has an “ultimate” move that can be used to turn the tide of team fights. This all results in some interesting tactics, but still retains the fast nature of the action combat. 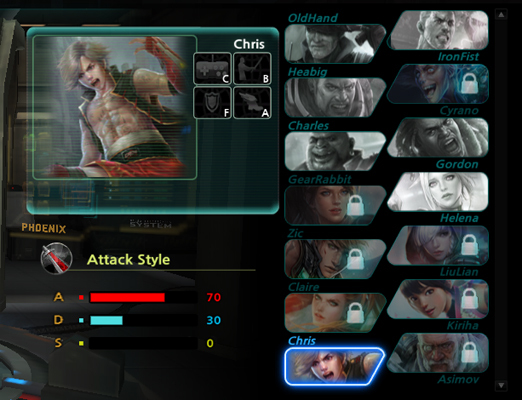 An interesting feature for the combat is the combo system. Every character has multiple combos it can execute. This makes things a bit more exciting and helps dissuade people from simply button mashing their way to victory. Making use of the combos will let you do the maximum amount of damage and be more effective as a player, so it’s something you’ll want to learn about each character. A lot of games have a combo system, but I would say Cronix takes it a step further than most. Cronix is the type of game you can pick up and enjoy in short bursts. A lot of MOBA (Or MOSA, I guess) games will require a huge time commitment and a lot of research and planning to be decent. With this one, you still need to practice, but you’re not going to be required to quit your job and dedicate six hours a day to become good. Strategy elements, at least in the currently offered game modes, aren’t very strong, though the action more than makes up for this (in my opinion). In the end, I would definitely checking this out AFTER it’s available on Steam (which shouldn’t be long after this article is released). If you don’t want to wait for that, though, I wouldn’t discourage you from heading over to the website and downloading the game right now. Features: 3/5 – Some nice features, but not many. Customization: 3/5 – Customization is weak, but more than the ‘skins’ that most games offer. Graphics: 4/5 – Nearly perfect. Controls: 4/5 – Needs key re-binding. Community: 3/5 – Needs more people, but decent. Overall: 3/5 – It didn’t blow me away, but it’s a solid game that I would suggest to almost anyone.